And the spotlight at The Linc – home to the NFL’s Philadelphia Eagles – was on the six rare disease research grant recipients drafted by our priority partners to become part of the Uplifting Athletes team. 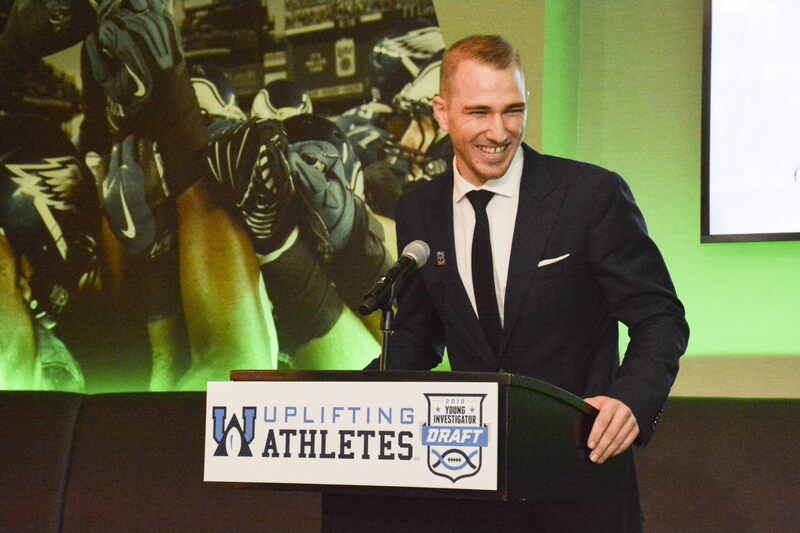 Similar to the NFL Draft where teams select the top young prospects they feel can make the most impact on their future, at the Young Investigator Draft, Uplifting Athletes celebrated its 2019 draft class in five different rare disease categories. The evening started with a social hour that included one-of-a-kind stadium tours of Lincoln Financial Field. Then it was time to kick off the 2019 Young Investigator Draft and hand out some authentic draft jerseys to research scientists in five rare disease categories: rare cancers, rare autoimmune and immunological disorders, rare blood disorders, rare genetic disorders and rare muscular and neurological disorders. The 2019 Young Investigator Draft class includes Dr. Shana McCormack, Dr. Elizabeth Harrington, Dr. Alberto Japp, Dr. Eugene Hwang and Dr. Brian Sworder. Young Investigator Draft grants are intended to inspire collaborative and translational research that will benefit the entire Rare Disease Community. The Young Investigator Draft stage provided each doctor a platform to educate and inspire by sharing their research along with its impact on the Rare Disease Community. The drafted grant recipients were chosen by this year’s priority partners: Accelerate Brain Cancer Cure, Castleman Disease Collaborative Network, Friedreich’s Ataxia Research Alliance, Leukemia Lymphoma Society and Project ALS. Each priority partner had a guest presenter make the selection. The 2019 list of guest presenters included Kyle Bryant, BethAnn Telford, Dr. David Fajgenbaum, Malik Turner and Adam Breneman. Dr. Brenda Gallie of Children’s Hospital in Toronto received the Uplifting Athletes Young Investigator Draft Collaborative Leadership Award for her decades of commitment to eradicating the rare eye disease retinoblastoma. She was introduced via video by former USC long snapper and 2016 Uplifting Athletes Rare Disease Champion Award winner Jake Olson, who is legally blind after losing both is eyes to retinoblastoma. Uplifting Athletes would like to thank everyone who attended our 2nd Young Investigator Draft and a special thanks to all of our sponsors for making this unique approach to rare disease research possible. In addition to CSL Behring as our presenting sponsor, Sanofi Genzyme, Horizon, PRA Health Sciences, Retrophin, Bristol-Myers Squibb, Spark Therapeutics, Strongbridge BioPharama, Amicus Therapeutics, We Work For Health (WWFH) and Ultragenyx all contributed to the success of the 2019 Young Investigator Draft.